of Seville since you can enjoy the processions there. 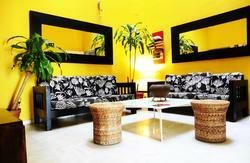 The hostal is to 10 minutes from the April Fair of Seville. For those who likes enjoying good wine, tapas, and also Flamenco, the Barrio de Santa Cruz, where we are placed, offers a great variety of typical and beauty bars which are crowded. What was in days gone by a Jewish quarter and Moorish quarter you can find even an ancient synagoge that is now a bar. Seville Picasso Backpacker offers shared rooms ( female, masculine or mixed) It is included clean sheets, blankets and bath gel. All the rooms have air condition, electric heating (heat), and TV. 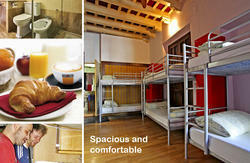 The hostel also offers to all the customers a funstion room with TV to drink free coffee and tea. The Hostal offers the use of Internet, and there are also bicycles and moutainbikes to be rent. Services included: breakfast with cornflakes, milk, tea and coffee; internet conection 24h. 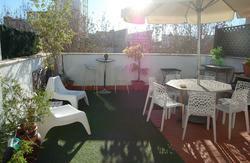 ; coffee and tea; WI-FI conection, wonderful views of the town since we are located to 50m close to Alcazar and 80m. to the cathedral and famous Barrio de Santa Cruz; tons of tapas bars just 100m. away, clean sheets, blankets, bath gel, kitchen and common area that can be used by our customers with all kind of facilities to cook; a small market just in front of the entrance to the kitchen; bikes to rent; air conditioning, electric heating; TV and hot water. Cancellation less than 15 days prior arrival - 50% charge, except for 1 night bookings that will be charged 100%. From the airport: There is a special bus in the exit of the airport that you can take to the centre of Seville and you have to get off in Prado de San Sebastin. Then, 5 minutes walking, turn to the right to the San Fernando street, and all straight on around 300 meters is Puerta de Jerez. In Puerta de Jerez, turn the first to the right, and that is San Gregorio street. Hostel Picasso Sevilla backpacker is in the San Gregorio street n 1. From train station: In front of the Santa Justa train station there is the bus C1. Get off of the bus in Prado de San Sebastin, and 5 minutes walking, the San Fernando street is there. Then, all straight on around 300 meters is Puerta de Jerez. In Puerta de Jerez, turn the first to the right, and San Gregorio street is there. Hostel Picasso Sevilla backpacker is in the San Gregorio street n 1. From the bus stations: Prado de San Sebastin bus station: When you get out of the station you, turn to the right and, in 20 meters, there is the Menendez Pelayo avenue. Cross the avenue and San Fernando street is there. Then, all straight on around 300 meters is Puerta de Jerez. In Puerta de Jerez, turn the first to the right, and San Gregorio street is there. Hostel Picasso Sevillea backpacker is in San gregorio street n 1. Plaza de Armas bus station: take the bus C4 and get off in Prado de San Sebastin. Cross the avenue and the San Fernando street is there. Then, all straight on around 300 meters is Puerta de Jerez. In Puerta de Jerez, turn the first to the right, and Gregorio street is there. Hostel Picasso Sevilla backpacker is in San Gregorio street n 1.